Our range of products include German Silver Handicrafts such as German Silver Vase, German Silver Candle Stand, Designer Silver Flower Vase, Silver Make Flower Vase, Silver Flower Vases, White Metal Doli / Palki and many more items. 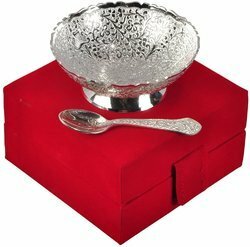 Return Gifts, Wedding Gifts, Silver Plated Bowl. All occasions are special , which is remembered and discussed for long, These Return Gifts are best not only for the family members, but the friends and relatives also. 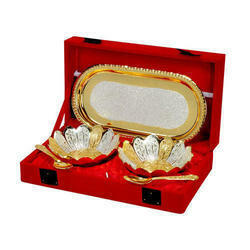 These Return Gifts are given to the baratis by the bride’s as well as Groom's family. And we makes it best choice for you. 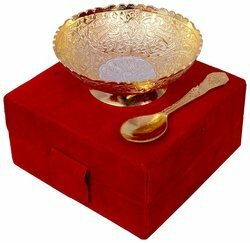 Return Gifts, Wedding Gifts, Silver and Gold Plated Brass Flower Shape Bowl. Wedding is an occasion, which is remembered and discussed for long, These Return Gifts are best not only for the family members, but the friends and relatives also. These Return Gifts are given to the baratis by the bride’s as well as Groom's family. And we makes it best choice for you. 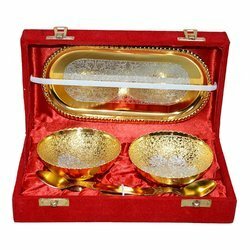 Return Gifts, Wedding Gifts, Silver Gold Plated Bowl. Wedding is an occasion, which is remembered and discussed for long, These Return Gifts are best not only for the family members, but the friends and relatives also. These Return Gifts are given to the baratis by the bride’s as well as Groom's family. And we makes it best choice for you.